I won this adorable Eggcellent spring stamp set designed by Lisa Lara, isn't it adorable? 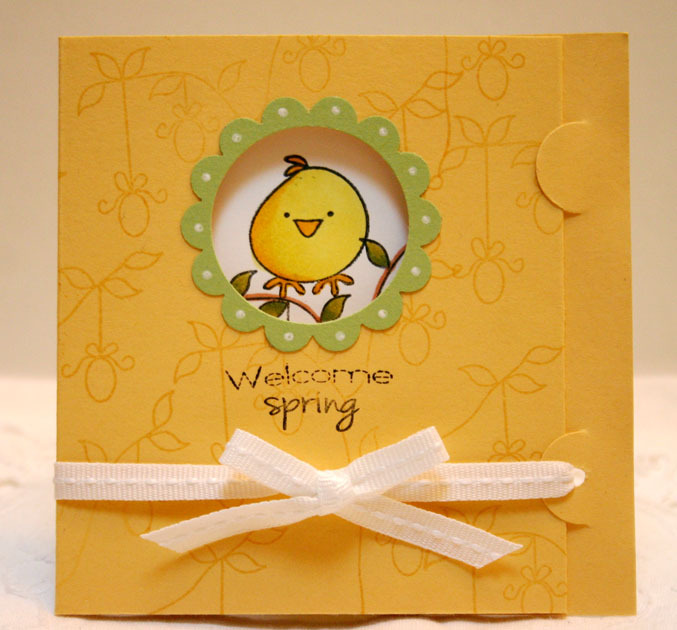 Love the little chick image with the egg tree and there are so many wonderful sentiments that come with it. Love it! For the tiles, I stamped the images from Papaya Collage on an Avery removable all-purpose label sheet. I carefully removed each one and added them to a piece of Basic Black cardstock. 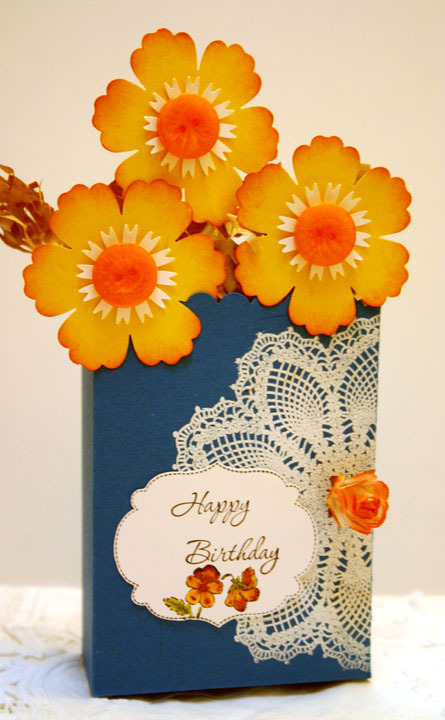 Paper pack using In-Colors along with Peach and Saffron cardstocks. 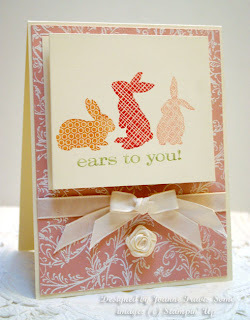 White stitched ribbon and Tagtastic sentiment. A super simple bookmark made using some of my cardstock scraps, punches, and retired Real Red grosgrain polka dot ribbon. This always reminded me of Minnie Mouse's bow so this was my inspiration for this bookmark. Sticky strip used to adhere punched images to ribbon. 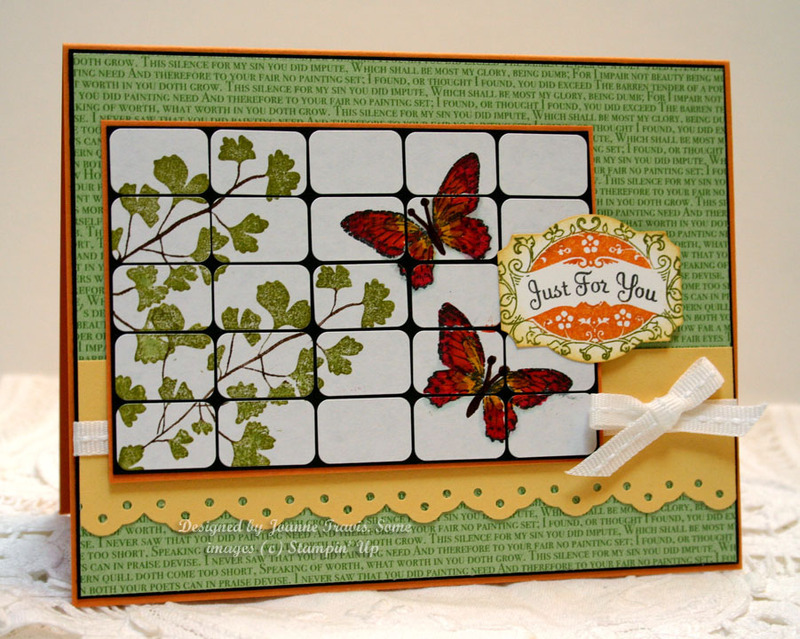 Stampin' Up Secret Garden with a window card (showing card open in second picture). Pool Party and Whisper White, flower colored in markers, scallop border punch and pearls to embellish. 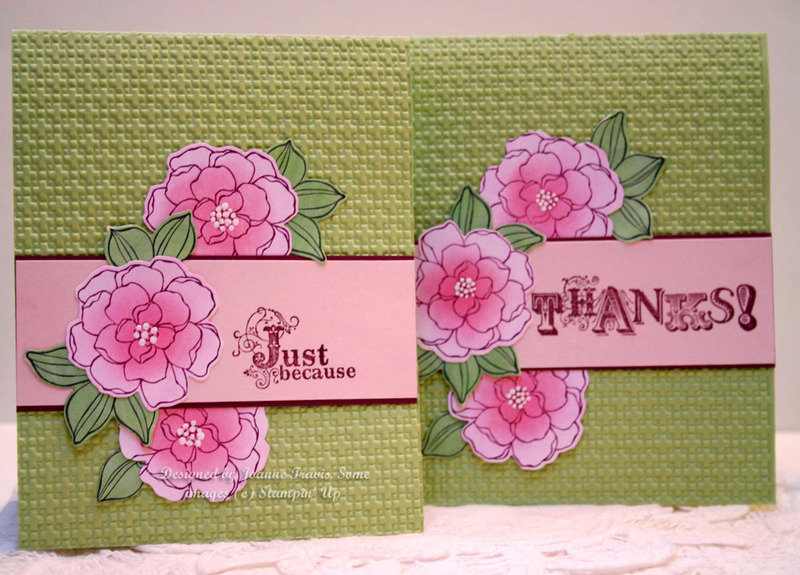 Flower stamped all over front in matching Pool Party ink, added clear liquid glue and Dazzling Diamonds to flower center. 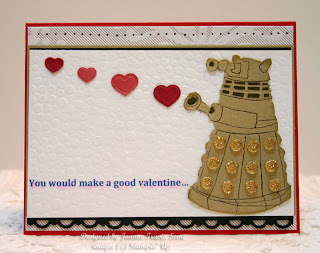 The sentiment is from the My Valentine set that I never got to use for the holiday, most of these stamps will work for lots of other occasions though. Some inspiration from Vegas, this was part of the view from our hotel room. 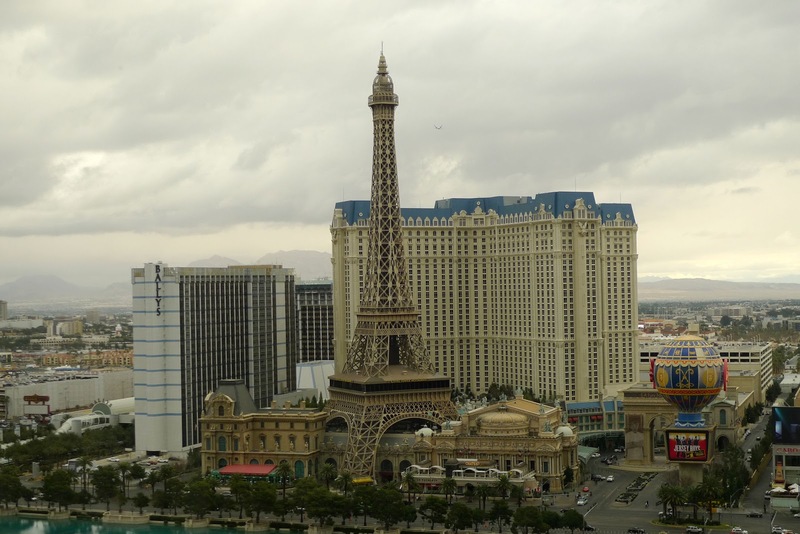 (I think we brought the crappy Seattle weather with us. It got really nice as we were leaving). I used the Stampin' Up supplies of Artistic Etchings stamp set and the colors of Whisper White as a base, Raspberry Ripple, Wisteria and Basic Gray (taffeta ribbon to match). Doily die cut and pearls to embellish. Old hardware from the retired kit and a non SU stick pin . This is for the Still addinktive challenge of a sketch and color combination. 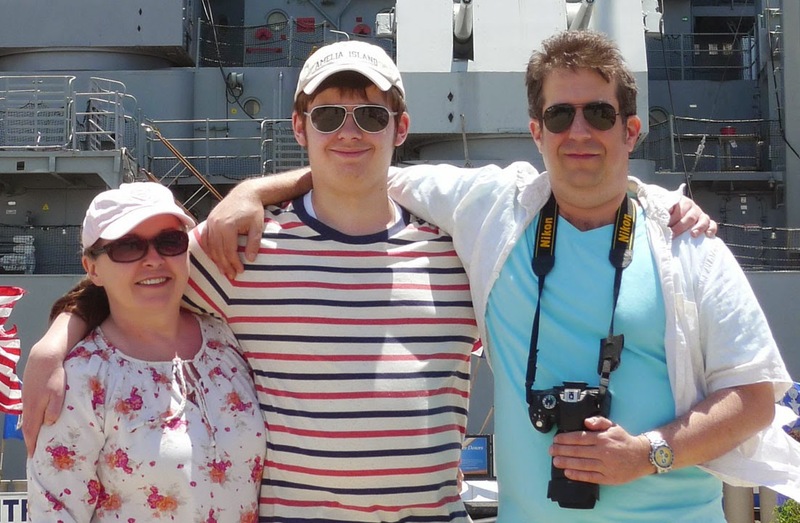 We had some wonderful dining experiences at Gordon Ramsay's restaurants. Burgr was the best hamburger I've ever had in my life. It was closed off one of the days as they were taping Master Chef in there. On our second visit we were seated two tables away from Graham Elliott, one of the judges. GR Steak in the Paris was also one of the best steaks of our lives and was cooked by Christine Wilson, the winner of last season's Hell's Kitchen. She nailed the Wellington this time, without a doubt! Awesome. Can you tell I'm a huge Gordon Ramsay fan? Working again with Bordering On Romance, I used the heart designer specialty paper from More Amore with Whisper White, Primrose Petals, and Pink Pirouette cardstocks. 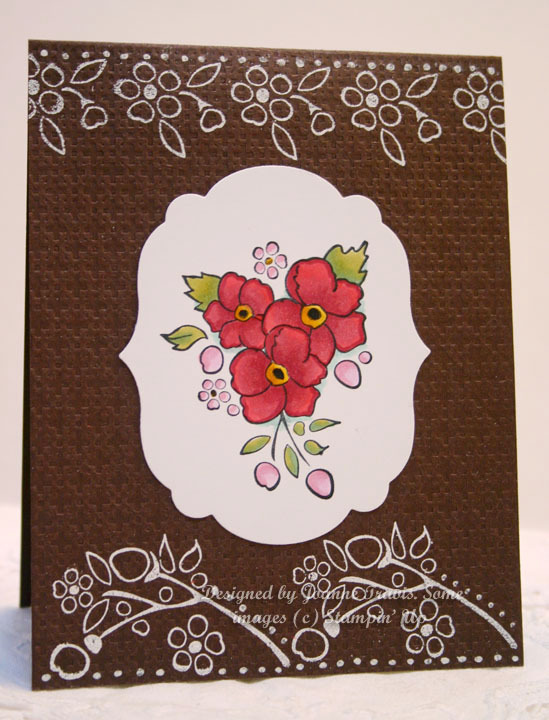 The flower was white embossed and colored with markers. Apothecary Art framelits die and designer builder brad also used. 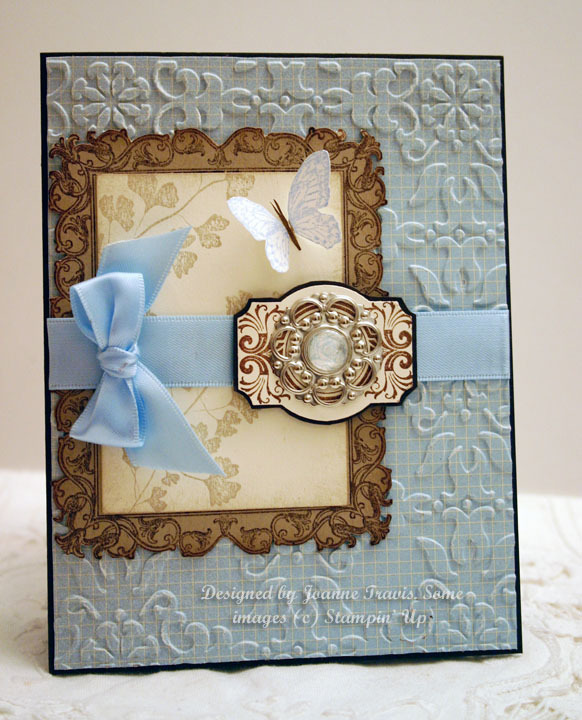 The lace and ribbon are from the Artisan Embellishments kit. Stampin' Up supplies of Bordering on Romance stamp set colored in markers on Apothecary Art framelits die cut in Whisper White. 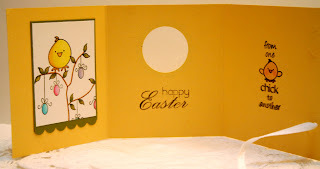 The Chocolate Chip base was white embossed with smaller flowers in set and accented with a white gel pen. 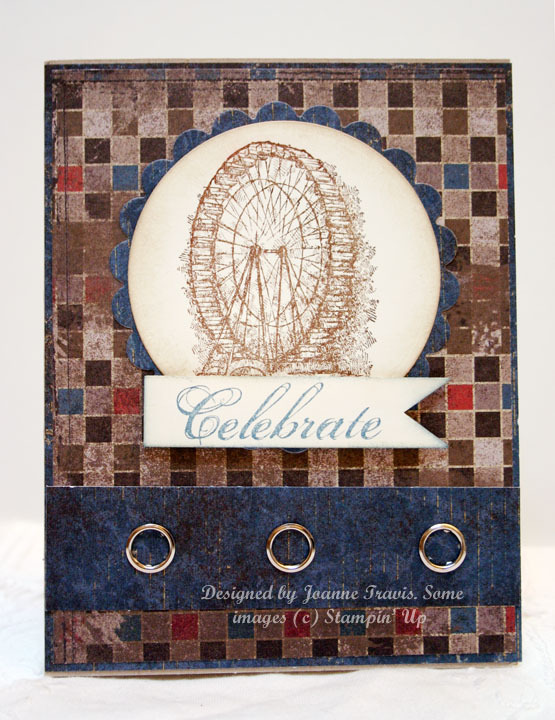 Stampin' Up: Hello, Doily embossed in white on Pacific Point cardstock. 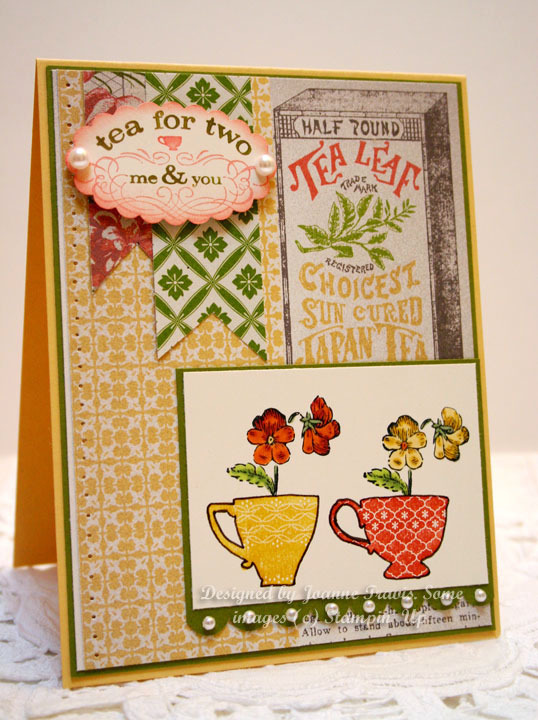 Sentiment is Memorable Moments with the flower sprig from Tea Shoppe. Artisan Embellishments rose, flowers from large punch in current catalog in Daffodil, the smaller white inner petals are a Martha Stewart flower punch, Pumpkin Pie buttons for centers. These are on lollipop sticks standing in gift packing shreds. This is a case of a project from last year's SU catalog for Hello, Doily. 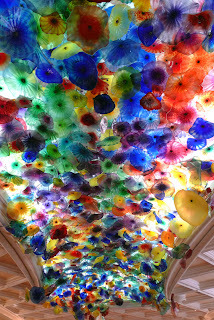 I loved the colors together, they really pop. Box pattern is from the Stampin' Up website. Sketch is from the Cardabilities challenge. 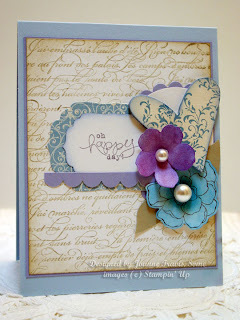 Stampin' Up supplies used were Bashful Blue, Amethyst, and White cardstocks. 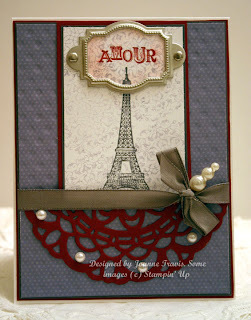 En Francais background stamped in Sahara, sentiment from Bloomin' Marvelous, Secret Garden flowers colored in markers and shaded with chalk pastels, pearls added to centers. Beau Chateau dp. Stampin' Up By The Tide stamp set embossed in gold on Glossy White. Inked with sponge in Mustard, Pool Party, Pacific Point and Not Quite Navy. 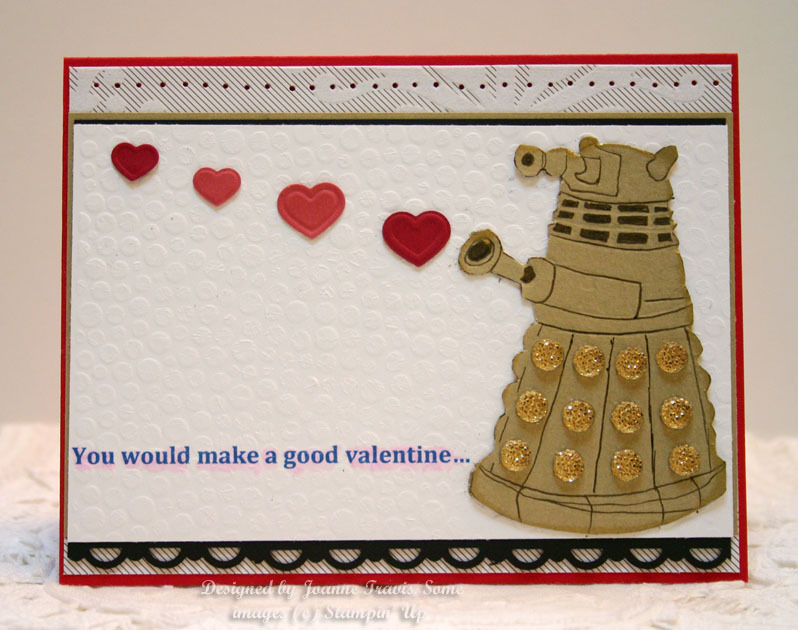 Sentiment is from SAB Bloomin' Marvelous. Black baker's twine non SU. More Ears To You since I already had these stamped from yesterday. Tea For Two designer paper, Vanilla and Blushing Bride cardstocks, vanilla taffeta ribbon and rose to embellish. 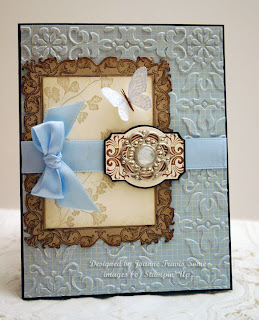 The embossed background is the retired Filigree, one of my all time favorite backgrounders along with the Bella Toile. 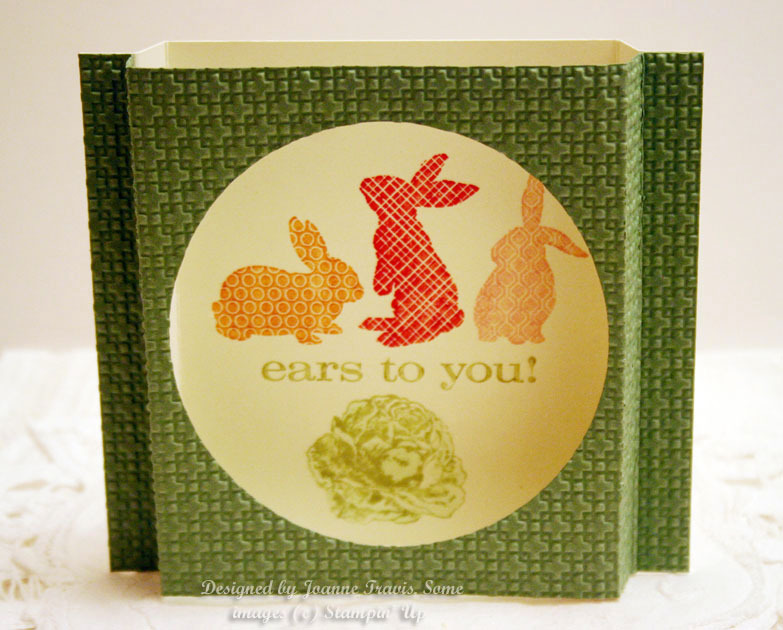 This is another of the individual stamps available at Stampin' Up right now and it is called Ears To You. I inked it up in Pink Pirouette, Poppy, Peach, Pear Pizzazz, and Celery. The bottom part is the rose from Papaya Collage but it sure looks like a cabbage to me. 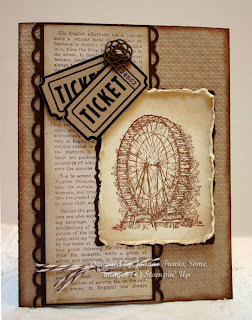 The card is a free standing style shadow box. To make this, I cut two A2 size pieces (4 1/4" x 5 1/2"), one in Wasabi, the other in Vanilla. Score both at 1/2', 1", 4 1/2" and 5". Run tape at both far ends and adhere two pieces after cutting a circle in the top one, fold to stand into a box. 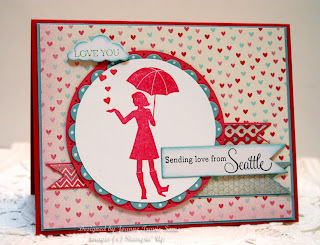 For this week's Mojo Monday sketch I used all Stampin' Up supplies of Love Letter dp on Cherry Cobbler base with Vanilla and Whisper White cardstocks. 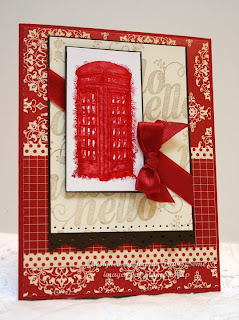 Feeling Sentimental phone booth stamp over new Hello, Hello single stamp panel that was stamped in Crumb Cake. Hello, Hello is an individually sold stamp from SU. Working on some more cards to send to Operation Write Home, I used the sketch challenge #159 from the Stars and Stamps blog, Stampin' Up's Feeling Sentimental stamp set on Well Worn designer paper (currently available in the clearance rack section), Crumb Cake and Vanilla cardstocks and the retired grommets in silver. I stocked up on designer paper so I could work on making cards for Operation Write Home this month, starting with this week's throwdown of Cards for Kids. I used the retired Unfrogettable set from SU that I saved especially for children's cards. 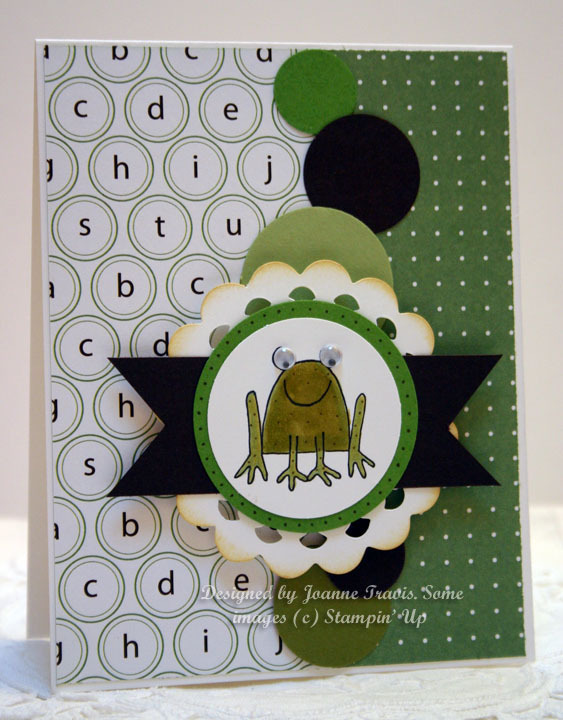 Love that googly eyed frog! The paper is Just Add Cake on a Whisper White base, the layout is from Basic Grey sketch challenge. Every year at about this time I get the gardening bug. Poring through seed catalogs, browsing the racks at the garden centers, stocking up on peat pots and starter soil. Oh, hurry spring!! 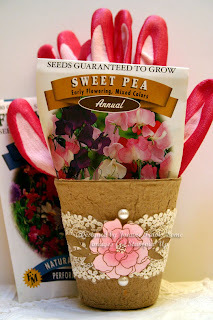 I used one of the peat pots to use as a little gift. 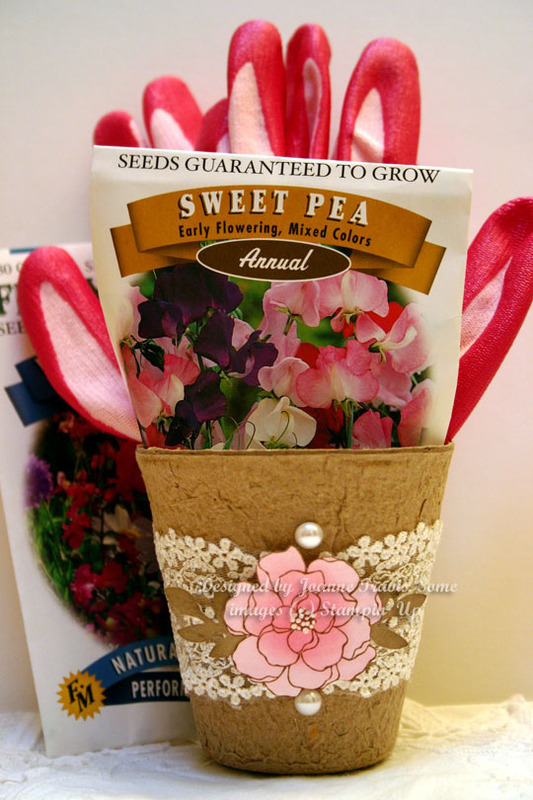 I got a six pack of gardening gloves at Costco for $6 and some new seeds to put inside. 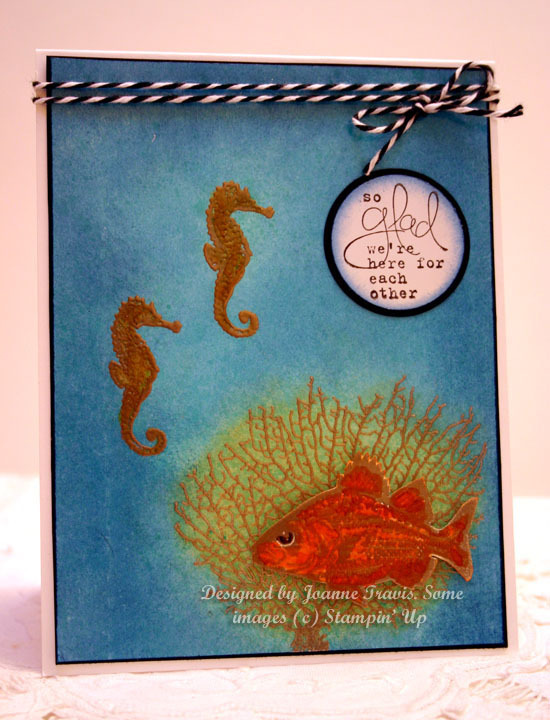 Stampin' Up supplies are in the current mini catalog: Secret Garden stamp set and Artisan Embellishments kit. Half pearls (regular catatlog) to accent. 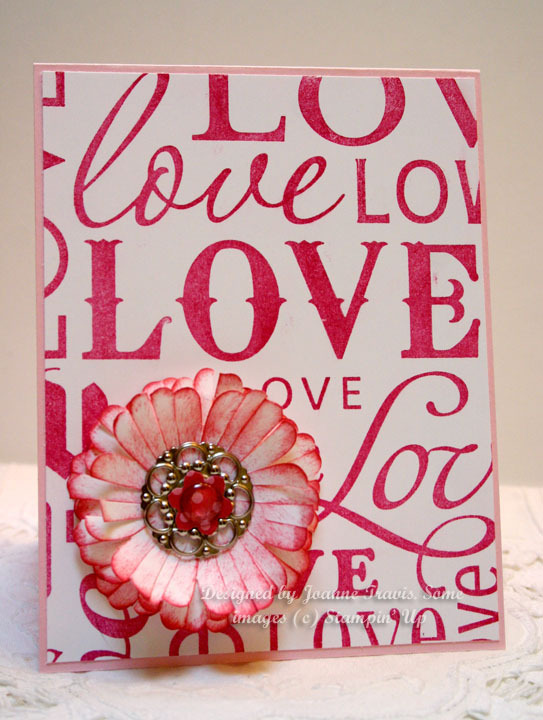 I went a little crazy on an order from the Clearance Rack at SU :) This is one of the items I couldn't resist, the Lots of Love Letterpress embossing plate for $1.59. 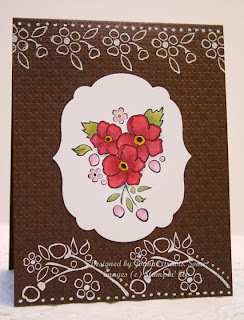 I inked it up in Primrose Petals on Whisper White, Pink Pirouette base. I kept it simple so you could see all of the lettering, just adding a flower that was made using the Blossom punch and a new designer build a brad. 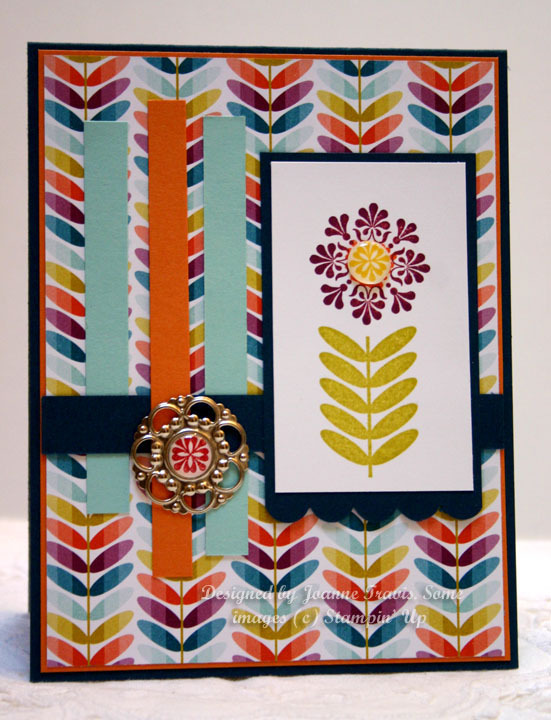 Center tiny flower was made using the three flower punch with the in-color designer paper patterns pack. 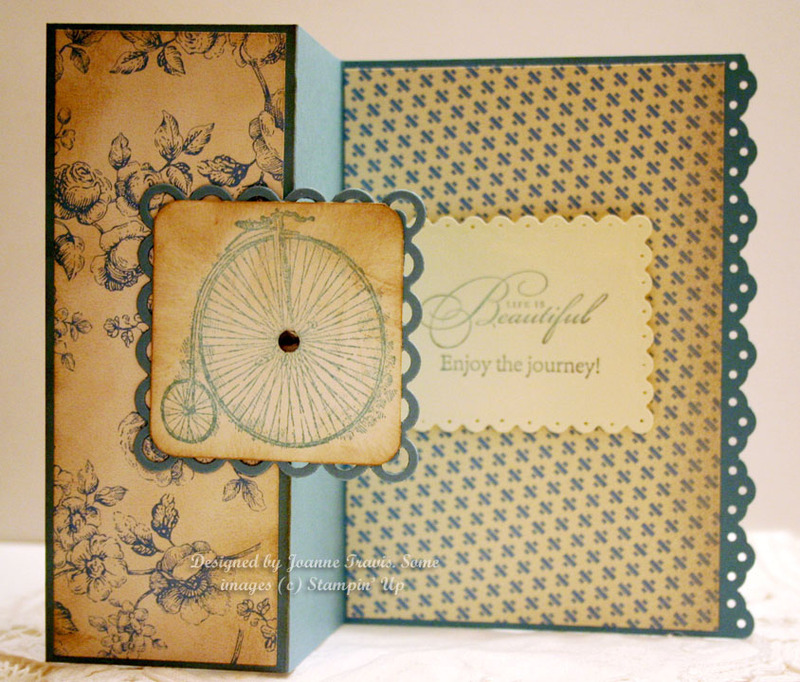 This is a case of a sample in a Stampin' Success demonstrator's magazine. 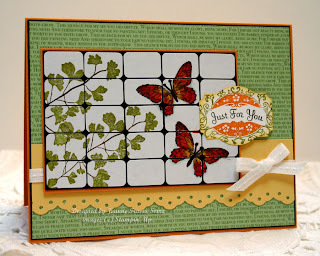 They used a different set (Awash With Flowers), this one is Secret Garden along with the matching framelits dies. I darkened the centers of the flowers with pastel chalks and added some white gel pen dots. 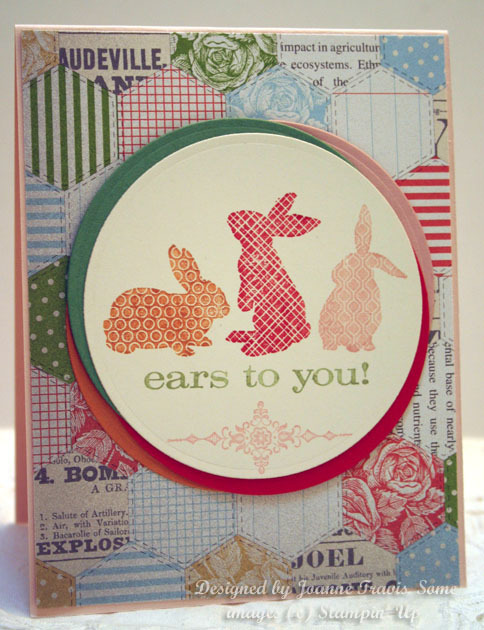 Cardstocks used were Celery, Razzleberry, and Pink Pirouette. Lattice Squares embossing folder for texture. Vintage Verses (SAB) for sentiments. 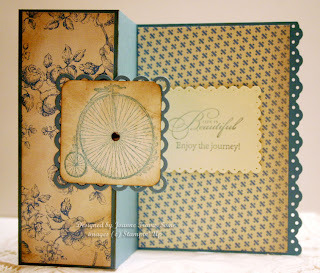 Stampin' Up supplies: Papaya Collage stamp set, Espresso, Vanilla, and Crumb Cake cardstocks with Bashful Blue 5/8" satin ribbon and the paper from Tea For Two. Embellishment from mini catalog. This is for the week's Still addINKtive's challenge of a sketch and color combo. I had my heart set on using the colors of Saffron, Sahara Sand, and Baja Breeze and the only paper I could find that fit the bill was this Attic Boutique paper. Still had a few sheets of this left. I stamped off the design from the large tea cup from Tea Shoppe in saffron and the added the Well Scripted sentiment in Baja. 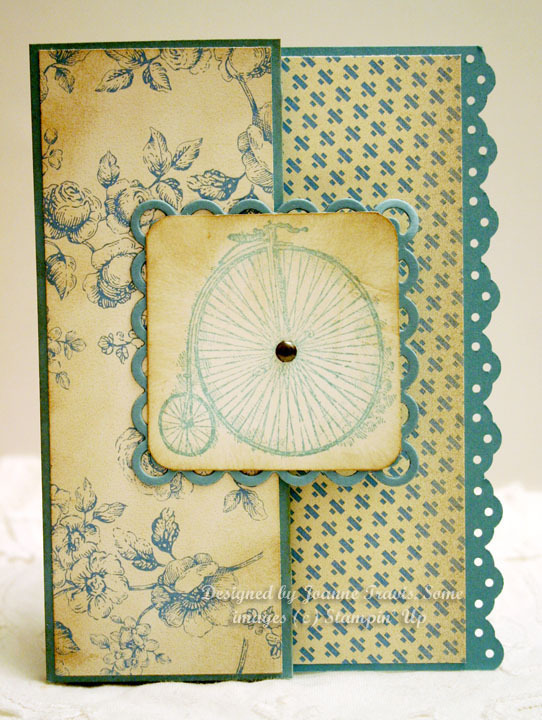 Scallop and large oval punches for this and the Vintage Wallpaper embossing folder for the surrounding panels. 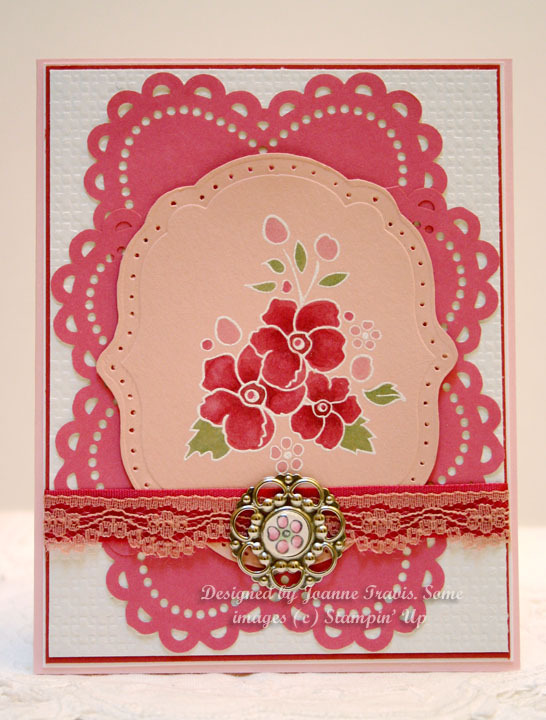 Embellished with half pearls and some lace trim from Artisan Embellishments kit. The bird and branch punch was used for the leaves in Sahara Sand. 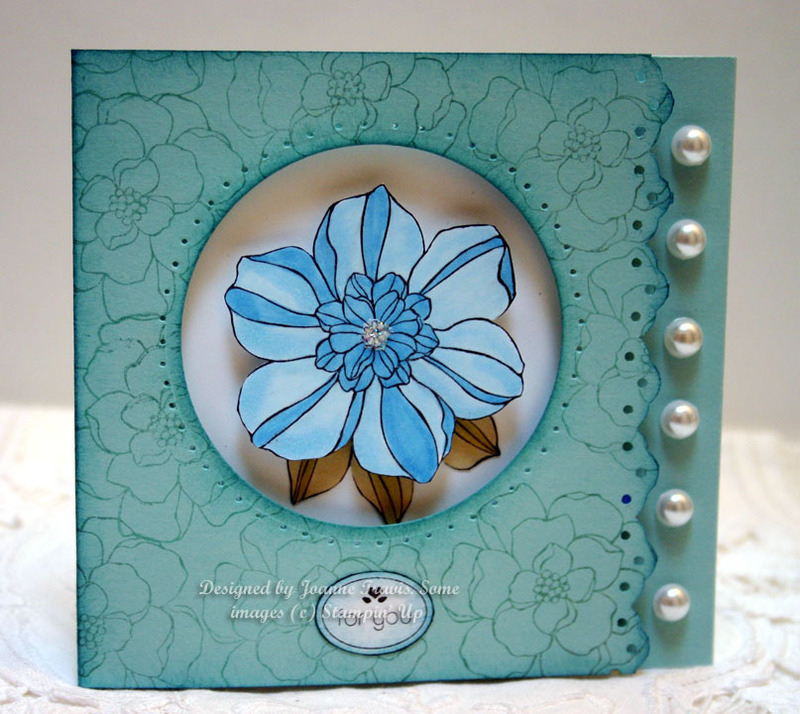 The small flower was punched from a white doily with the 1 1/4"scallop circle punch, secured with a white neutrals brad and edges were inked in Baja. 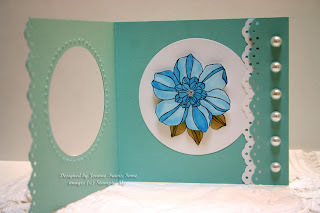 It looks a bit flattened in picture but I have since fluffed it up so it looks more like a rose :) This layout is for the Mojo Monday sketch this week. 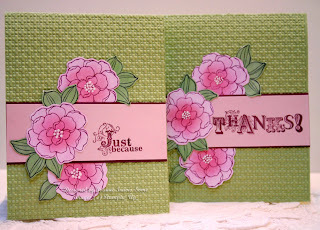 Stampin' Up SAB set Million Dollar Moments was used along with More Amore designer paper for today's 365 Cards Sweet Sunday sketch. I used Primrose Petals, Baja Breeze, and Whisper White cardstocks and a Seattle sentiment that I picked up at our local Impress store. The little cloud at the top has a sentiment from SU's Itty Bitty Banners set. 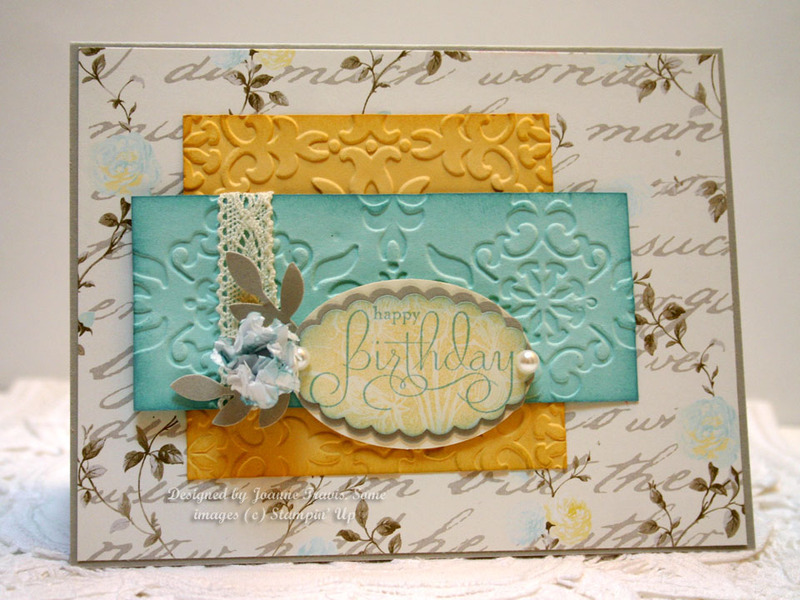 Feeling Sentimental in Baja Breeze and Vanilla with Beau Chateau paper (retired). This is a z-fold card, A2 size and scored at 2 1/4" and 4 1/4". I centered up the sentiment so the top image panel covers it completely when closed. For this I used Style Beautiful and Pedaling Past (retired). I love the vintage, nostalgic feel of these images from the SAB Feeling Sentimental set. They seem to want to be done in monochromatic and sepia tones, like an old photograph. I used Crumb Cake as the base and ran it through the Big Shot with the Lattice Squares folder. I ran it through again with no folder, just the plates, to flatten out the pattern. 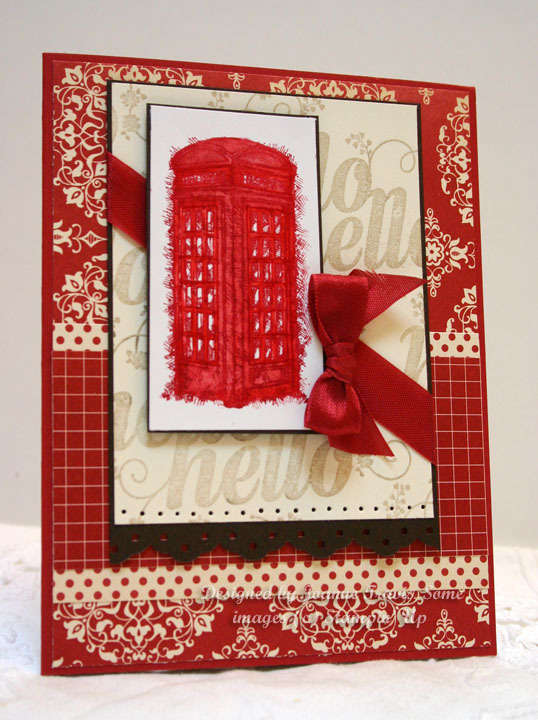 This gives it a nice look of textured cardstock. Inked edges in Soft Suede. 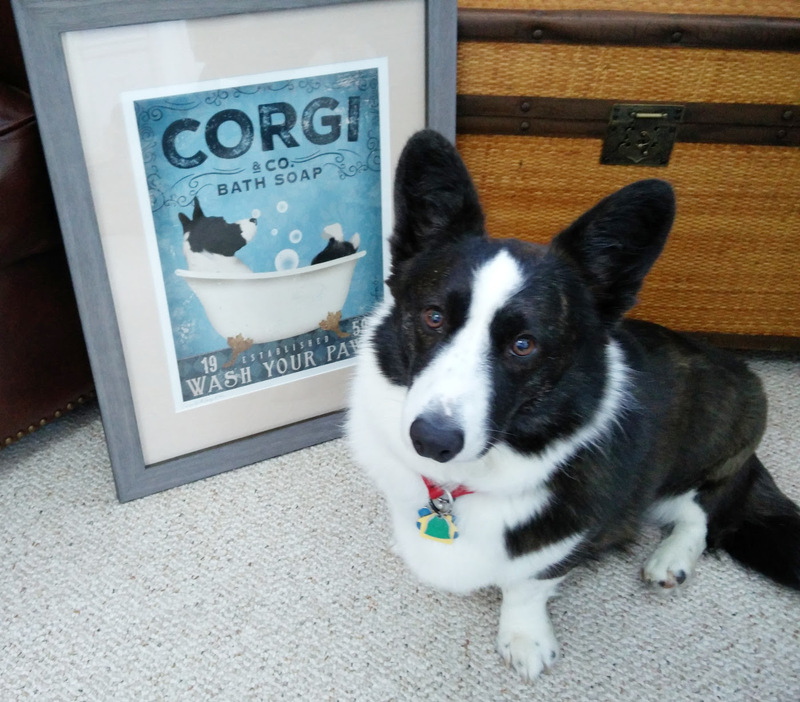 The main image was stamped in Suede also and edges inked in Crumb Cake. 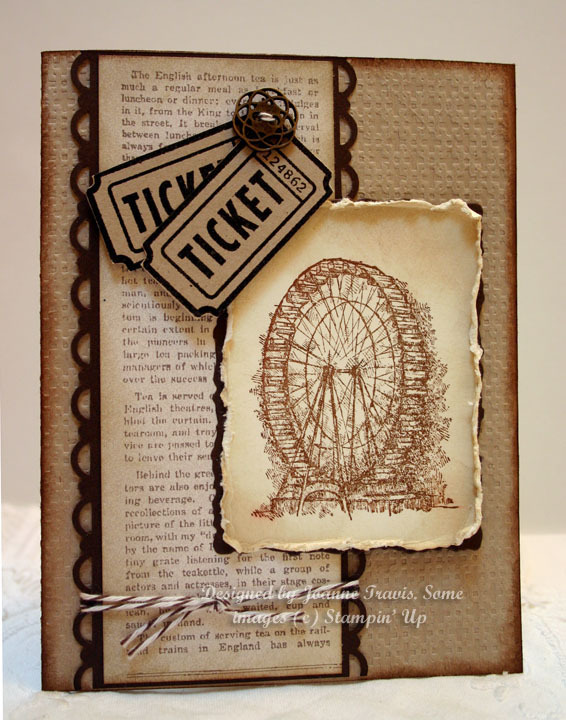 The matting was Espresso, the paper Tea For Two, the tickets were from the wheel, button from Artisan Embellishments kit with some Espresso baker's twine. This set will be great for masculine cards! 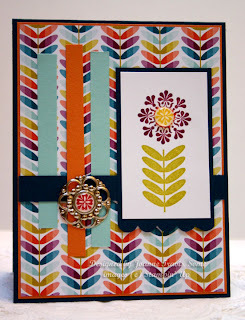 All Stampin' Up: Tea Shoppe stamp set colored with marker colors of Celery and Olive, Tangerine and Pumpkin, Saffron and Banana. 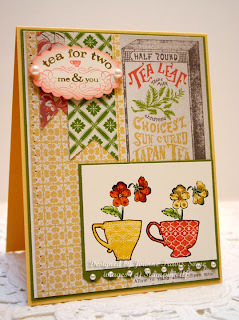 Tea For Two paper with a base of So Saffron, matted with Olive, Very Vanilla. Half pearls to embellish. Layout is this week's SCS sketch. I outlined the cups with an artist's sketch pen in sepia (Pitt) to make them stand out a bit more.